Brittney Griner broke the Big 12 career scoring record tonight. In scoring the first four points for Baylor against Texas Tech, the senior center reached 2,837 points. The former record was 2,835. Rutgers is set to announce its move to the Big Ten. Central Michigan has a unique young inspiration this year – a cancer patient. Purdue’s Drey Mingo is turning darkness into light. Florida senior Jennifer George has been battling injuries, thus the Gators have been struggling. Krista Donald is back for Georgia with a bang. Florida Gulf Coast’s success isn’t just because of their three-point shots. Post-season shot: Missouri’s magic number is three. Center Nikki Greene and Penn State are scripting a story book season. Kaleena Mosqueda-Lewis is putting her three-point stamp on UConn’s season. 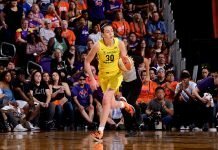 Breanna Stewart is getting into a rhythm for the Huskies. But her learning curve continues. Tamika Catchings impacted the Lady Vols with an impromptu post-game speech after their loss to Notre Dame Monday. Isabelle Harrison, injured during the game, will need surgery to repair the meniscus in her left knee. Recent injuries leave the Lady Vols inexperienced in the post. Total access with senior Taber Spani. Angel Goodrich’s shot for Kansas forced an overtime, and the Jayhawks upset #23 Iowa State, 78-75. Identical score as #12 Louisville squeaked by South Florida. Shoni Schimmel had a career-high 38 points. #17 Dayton’s 60-49 defeat of VCU means they’re 6-0 in the Atlantic-10. Maya Moore scored 53 points for her team in China. But after the game, fans beat up the referees.